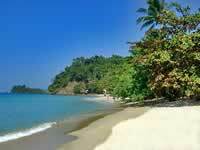 Virtual Travel & Island Guide about Lonely Beach on Ko Chang in Thailand. 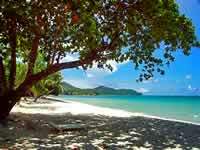 Lonely Beach (Haad Thanam) is approximately a 1 kilometre-long beautiful picture postcard beach on Ko Chang. It is the northern part of Bai Lan Bay (Aow Bai Lan), but due to its popularity it is introduced on its own page. The beach is situated on the southern end of the west coast, separated from Kai Bae Beach in the north by a large wooded hill, while its southern border is the rest of Bai Lan Bay. 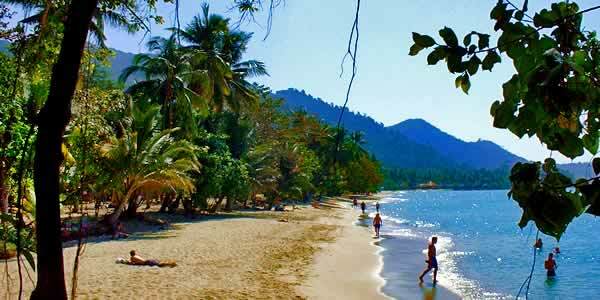 The northern part of the beach consists of fine, white sand while the southern section is stony. 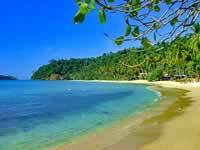 For many people Lonely Beach is the most beautiful beach on the entire island. Especially the north because the beach dips relatively steep into the sea and there are no stones on the ground, so getting into the water is easy. Also swimming at low tide isn’t a problem there. In the village of Lonely Beach, which is beside the village of White Sand Beach the busiest on the entire island, you'll find a lot of Thai and european restaurants, bars, souvenir shops, some supermarkets, Internet Cafés and diving-schools. Also quite a lot of guesthouses and bungalow resorts are located along the road through the village. In the resorts along the beach kajaks and motorbikes can be rented to explore the beach or the island. Coming from the north, one has a fantastic view from the road over the entire beach down to the southern end of Bai Lan Bay. 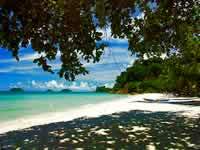 (See 'What to do on Ko Chang? ', 'Viewpoints on Ko Chang' and on the right panorama picture). Lonely Beach can be reached from the piers in approximately 1 hour by taxi. If you have advanced bookings you should tell the taxi driver the name of the resort or the hotel. All 360° virtual reality panoramas and photographs from May 2005 or April 2008. We introduce the Siam Beach Resort on an own page with virtual reality panoramas, photographs, panorama pictures and information. Bookings for the Siam Beach Resort are possible! We also introduce the Bhumiyama Beach Resort on two pages with virtual reality panoramas, panorama pictures, photographs and information. Bookings for the Bhumiyama Beach Resort are possible!